People of Polish immigrant origins and ancestry have made up the second largest European origin and ancestry grouping in Milwaukee since the 1880s, after the far greater population of German immigrants and their descendants. Millions of Poles wound up emigrating from every region of their country from the 1850s onward in quest of work opportunities (along with religious and political liberty) that were absent in their impoverished, overpopulated and foreign-ruled homeland. Most of those who settled in Milwaukee (and Wisconsin) followed German immigrants from the empire to the Badger state. Polish immigration to Wisconsin and Milwaukee dates back to the late 1850s and became particularly noticeable from the 1870s onward. The Poles who settled in Milwaukee and the state came overwhelmingly from the German ruled provinces of Posen (Poznań in Polish), Silesia (Śląsk or Schlesien), and the Baltic seacoast (called Pomerania by the Germans). Indeed, a 1905 Wisconsin census reported that 80.5 percent of Milwaukee’s Poles were from these territories. These areas, however, constituted just 15 percent of the Polish lands that had been seized by Prussia (the forerunner of the German empire), tsarist Russia, and imperial Austria between 1772 and 1795, when they combined to erase the vast but militarily weak Polish Commonwealth from the map of Europe. The Polish immigrants who later settled in Illinois, Michigan, Pennsylvania, Massachusetts, Connecticut, New York, and New Jersey came more heavily from the poorer and more rural Russian and Austrian ruled Polish lands in search of jobs in the coal mines, steel mills, and automotive industry. But few Poles from those territories made their way to Milwaukee. The Milwaukee Polish connection with the German empire was significant in another way. The repressive, widely publicized, assimilationist policies the German empire implemented in its Polish provinces sparked wide resentment there and among Polish immigrants in America. They received great attention in Milwaukee’s widely read Polish language newspaper, the Kuryer Polski, which deepened national feelings among the city’s Poles. From the first Polish immigrants who arrived in Milwaukee in the 1850s, the number of Poles in the city rose to 7,000 in 1874, according to the Milwaukee Sentinel. This number grew to 30,000 by the end of the 1880s. The Polish population in Milwaukee by 1910 reached 70,000. The Kuryer Polski claimed even higher numbers, suggesting that as many as 100,000 Polish immigrants and their American-born offspring called the city home in 1915. Interestingly, in 1900, the U.S. census counted 17,854 Polish immigrants in Milwaukee (to 53,854 Germans), a number that excluded their “second generation” American-born children. In 1930, Milwaukee’s Polish immigrant population numbered 19,593 in a city of 569,000. In 1970, Polish immigrants, together with their “foreign stock” American-born sons and daughters, amounted to 28,865 in a Milwaukee of 717,000. By then the overwhelming majority of Polish Americans were the grandchildren or great-grandchildren of immigrants. Many were already only partly of Polish ethnic heritage. In comparison, in cities like Chicago and Detroit, the number of Polish immigrants continued to grow. In contrast, far fewer Poles came to Milwaukee during the second wave (1939-1959) and the third wave, the “Solidarity Emigration” taking place from the late 1970s to early 1990s. Early on, the Poles who settled in Milwaukee congregated in a number of neighborhoods where their presence was underscored by the many institutions and establishments they built there. The largest was on the city’s near south side—originally west of Lake Michigan to about 27th Street and south from Greenfield to Lincoln avenues, then spreading further south and west. From the late 19th century into the 1960s Mitchell Street, known popularly as the “Polish Grand Avenue,” was the center of “Polonia” commerce and community life in this section of the city. A second, smaller Polonia community arose on Milwaukee’s Lower East Side—from Humboldt Boulevard and Brady north to Capitol Drive. Smaller communities also formed in the adjacent towns of South Milwaukee and Cudahy. From the 1870s until 1925, a small but distinctive group of newcomers were the Kaszubs from Poland’s Baltic seacoast. They established a fishing community of as many as 1,600 residents on nearby Jones Island, on Lake Michigan. Having no title to their dwellings, they were evicted from the island to make way for new port facilities and a sewage treatment facility. Since the 1960s, many people of Polish origin have moved out of the South Side to areas south and west of the city of Milwaukee and in smaller numbers to the north and west. By 2010, only 9.6 percent of the city’s population was Polish, or about 57,000. In Waukesha County, 9.2 percent of the population was listed as Polish in 2010. Smaller numbers also moved to other neighboring counties. An important explanation for this development has been Milwaukee’s decline as a heavy industrial center providing a plethora of decently paying jobs. At the same time, along with a general population decline since 1960, the overall ethnic character of Milwaukee also changed dramatically. The ethnic makeup of Milwaukee’s South Side in 1980 was still predominantly Polish, with 40 percent of the residents classifying themselves as such. By 2010, 70 percent of this area’s population was Latino, with another 11 percent African American. The Polish residents who remained in the area were largely older and often poorer. From their earliest days in Milwaukee, Poles found work in the steel and iron works, at the Polish-owned Maynard Steel Company, in the meat processing plants, tanneries, and in construction. Such companies as Pfister & Vogel, Allen-Bradley, A.O. Smith, and Allis-Chalmers employed Poles in large numbers. Polish workers took part in the tragic Bay View Rolling Mills protest in 1886; later many became active in the organized labor movement. Poles initially were on the low end of the wage scale; however, their industry, frugality and willingness to call on their working-age children to turn their earnings over to the family led to remarkable rates of home ownership. The distinctive “Polish flat”—a single-story, frame building set three to four feet above the street to permit a partly above-ground basement apartment and storage area—was a popular type of dwelling; it was readily expanded to include a second floor addition with more rooms in the back of the lot too. Already by the 1950s, growing numbers of Polish Americans were attending college and finding employment in management, the professions, and in public service as teachers and in the police and fire departments. The vast majority of Poles in Milwaukee (and everywhere in the U.S.) were and remain staunch Roman Catholics. In Milwaukee their first parish church, St. Stanislaus Bishop and Martyr, was purchased in 1866 near Mitchell Street and was soon complemented by the very first Polish parochial school in America. In 1872 an impressive brick and stone church (now a national historic site) was erected on Mitchell and 5th Streets. In 1871 a second parish, St. Hedwig’s, on Humboldt and Brady streets on the city’s Lower East Side was dedicated. As the Polish community mushroomed, five more parishes were established by 1900: St. Hyacinth in 1883, St. Vincent de Paul and St. Josephat in 1888, and Saints Cyril and Methodius in 1893 on the South Side and St. Casimir in 1894 on the Lower East Side. All were ornate and richly decorated and all maintained parochial schools staffed by orders of Polish women religious, most notably the Felicians, the Sisters of Notre Dame, and the Sisters of St. Joseph. A Polish orphanage and an enormous cemetery named in honor of St. Adalbert were also functioning. A half century later no fewer than twenty flourishing parishes established by Polish immigrants and their offspring could be found in the city and its adjacent communities. Along with the parishes, Polish Milwaukee early on saw the rise of a large number of voluntary organizations. The first, in 1874, was the Kosciuszko Guard, a south side unit of the Wisconsin National Guard. Founded by men inspired by the heroic service of General Thaddeus Kosciuszko in America’s war for independence and Poland’s fight for freedom, the unit served with distinction in both World Wars before being disbanded in the 1950s. Milwaukee Poles were also soon active in both the local and national affairs of the mass member fraternal societies, most notably the Polish National Alliance, Polish Roman Catholic Union, Polish Women’s Alliance, and Polish Falcons, and formed dozens of neighborhood-based lodges of these organizations. The fraternals’ mission was to provide life insurance protection for their members, along with a variety of cultural, educational, and social benefits—all linked to their commitment to the cause of Poland’s independence and its people’s material needs, before, during and after both World Wars. Two Polish American fraternals originated in Milwaukee. One, the Polish Association of America, was formed in 1895 and had a distinctly Catholic character. Federation Life Insurance of America, founded in 1912, owed its existence to Michael Kruszka, editor and publisher of the Kuryer Polski newspaper. One of its goals was to push for the appointment of a clergyman of Polish origin to be a bishop in Milwaukee. This goal was realized in 1914 with the elevation of Rev. Edward Kozlowski to this office. 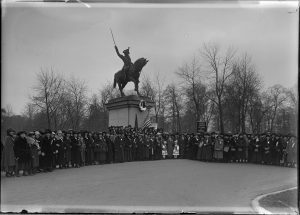 After World War I, many Polish veterans from the American armed forces joined the newly formed Polish Legion of American Veterans. Those who had served in the Polish army that fought in France and Poland on behalf of Poland’s independence joined the Polish Army Veterans Association. Both groups, together with post-World War II newcomers to America who had fought for Poland and formed the Polish Combatants Association, were visible and influential forces in Milwaukee Polonia into the 1980s and beyond. The first Polish Legion of American Veterans post in Wisconsin was established on Milwaukee’s South Side in 1923. The Polish Army Veterans Association established two posts in Milwaukee, the first already in 1920. 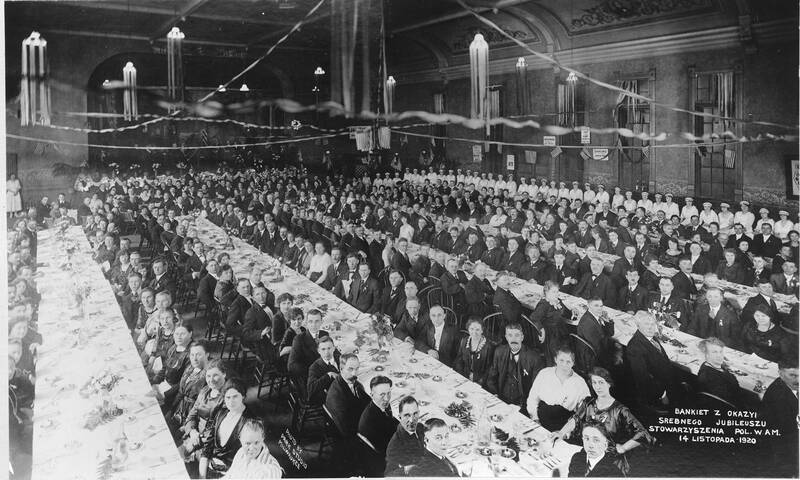 Both groups actively raised money for veterans’ relief and to assist in devastated Poland’s reconstruction after World War I. Like the fraternals, they were active in purchasing war bonds and in supporting Poland’s freedom during World War II. Though supporters of the Democratic Party, from the 1900s until the early 1930s many Poles turned to the Socialist Party. Between 1908 and 1932, ten Milwaukee Polish socialists won elective office to the city council and state legislature, compared to eight running as Democrats, four as Republicans, and ten as non-partisans. John C. Kleczka, a Republican, won election in 1918, becoming the first Pole to enter the U.S. House of Representatives. Progressive Republicans such as Robert La Follette and his son Philip did well among Poles in Milwaukee. But the disastrous Great Depression saw Poles returning overwhelmingly to the Democrats. In 1932 the four south side city wards with the largest Polish populations gave Presidential nominee Franklin D. Roosevelt 92.6 percent of the vote over the Republican incumbent Herbert Hoover (to 67 percent of the citywide tally). FDR did about as well in winning reelection in 1936, 1940, and 1944. In the years after, Milwaukee’s historically “Polish wards” remained Democratic but by smaller margins. By the 1980s, however, many were “Reagan Democrats”—in other words, conservative or even Republican voters. This was especially true among those who had moved out of the city and had a higher social and economic standing than Poles of earlier times. If one political outlook reflected the views of most Polish Americans by then, it was that of long time U.S. Congressman Clement Zablocki. A devoted supporter of federal programs like Social Security and Medicare and an advocate of a strong U.S. military, Zablocki took an anti-communist stance in supporting Poland’s freedom and was a conservative on the hot button religious and social issues that had surfaced. Early on, ambitious Poles benefited from their organizational ties in succeeding in local politics. While no Polish American has been elected Mayor, between 1890 and 1972 five Polish Americans held the city-wide office of Comptroller, Milwaukee’s “Polish Mayor.” Most prominent was Louis Kotecki, in office from 1912 to 1933. Three Polish Americans were appointed to be the city’s chief of police, most recently Robert Ziarnik, who served from 1984 until 1989. Following in the footsteps of John Kleczka, four other Milwaukee Polish Americans later won a seat in the U.S. House of Representatives—Democrats Thaddeus Wasielewski (1941-1947), Zablocki (1949-1983), Gerald Kleczka (1985 to 1993), and north side Republican Charles Kersten (1947-1949, and 1951-1955). Over the years a number of Milwaukee Polish Americans have achieved broader recognition for their activities. From the 1860s to the end of World War I in 1918, the Kruszka brothers were prominent figures, Michael as newspaper publisher and political leader, and Wenceslaus, a clergyman working for the appointment of Polish bishops in America and Polonia’s first historian. Socialist and labor union activist Leo Krzycki was a powerful force in this era and after, locally and nationally. During the era between 1920 into the 1950s, Francis X. Swietlik played a national leadership role in the Polish community and headed Polonia’s Polish relief effort during and after World War II. Two Catholic clergymen, out of the many Poles who served their parishioners in Milwaukee, merit mention here as church and community leaders—the Rev. Felix Baran, pastor of St. Josaphat Basilica parish (1914-1942), who wiped out its enormous debt and raised the funds to decorate the church in regal fashion, and the Rev. Raymond Punda, the “big thinking” pastor (1958-1979) of the “mother church of Milwaukee Polonia,” St. Stanislaus Bishop and Martyr parish, and head of its very own high school. The first community-wide Polonia federation of organizations was the Casimir Pulaski Council of Milwaukee County, established in 1928 to honor the tenth anniversary of Poland’s independence. Representing at its height as many as 100 local groups, the Pulaski Council worked to influence local civic and political affairs and encouraged primary and secondary schools to include information about Poland’s history, art, and culture in their curriculum. Led by individuals like Judge Frank Gregorski and William Kowalkowski, the Council sponsored a heavily attended summer school at Kosciuszko Park for many years. Founded in 1944, the Wisconsin Division of the Polish American Congress (PAC)—under a series of dedicated activists, among them Edmund Banasikowski, Thomas Czerwinski, and Edward Tomasik—focused their efforts on opposing Communist rule in Poland. In 1953, Harriet Gostomska, Felicia Kwasieborska, Maria Laskowska, and Angela Mischke organized the Polish Women’s Cultural Club of Milwaukee, ‘Polanki.’ They and successors like Janet Dziadulewicz Branden worked to promote knowledge of the Polish heritage in a host of ways. Over the years Polanki hosted and supported countless public lectures about Poland, performances of Polish classical and modern music, and theatrical events, and sponsored a significant scholarship program for outstanding college students of Polish heritage. In the early 1950s yet another initiative, one led by Polish newcomers to Milwaukee, resulted in the creation of the Polonia Sport Club, an organization which has grown to involve hundreds of participants on teams for children, young adults and older players and which manages its own set of soccer fields and a community center. The members of these organizations later gave their support to the creation of the Polish Heritage Alliance of Wisconsin, sponsor of the annual Polish Festival in Milwaukee and the Polish Center of Wisconsin. The annual Polish Festival, inaugurated in 1982 on Milwaukee’s lakefront Summerfest grounds, today is America’s largest such event. The Polish Center of Wisconsin, located in the adjacent city of Franklin, was dedicated in 2000 and hosts a plethora of Polish American cultural and social events each year. In addition to creating the Polish Heritage Alliance, community activists joined forward-thinking faculty and administrators of the University of Wisconsin-Milwaukee (UWM) and Polish Americans in the state legislature to create what became its very productive Polish Studies Committee in 1979. They restored St. Josaphat Basilica (1990-1998), supported the Milwaukee Art Museum exhibition, “Leonardo da Vinci and the Splendor of Poland” (2002-2003), and funded the restoration of the Kosciuszko monument in 2013. Another achievement is the UWM Library’s preservation of the remarkable Roman Kwasniewski photograph collection of pre-World War II Polish Milwaukee. In the 1980s Milwaukee’s PAC led local Polish American and community-wide humanitarian relief work on Poland’s behalf. A vibrant dialog with Milwaukee’s Jewish community was established. After 1989 Polish Americans took a lead role in obtaining federal funding to support improved medical services and the transformation of local government in the newly democratic Poland and played a visible role in working for Poland’s entry (in 1999) into the NATO Alliance. Milwaukee County established an ongoing sister cities relationship with the city of Bialystok. With the Milwaukee Archdiocese, Milwaukee’s Polish community created a parish for Polish newcomers who began arriving in the 1970s. Polish Americans in Milwaukee are fewer in the 21st century than they were in the past. Most Polish Americans in metropolitan Milwaukee and throughout Wisconsin are fully assimilated Americans. As a result, fewer are more than tangentially involved in Polonia’s life (aside from attending the annual Polish Fest). There are fewer active secular and church-based Polish American organizations. Nevertheless, and decades after the end of mass Polish immigration to Wisconsin, a cadre of well-informed activists continues to play a real role in enriching the cultural life of Greater Milwaukee. Over the past 160 years and more Milwaukee’s Polish community has evolved greatly. Initially a fast growing but separate settlement of immigrant newcomers, Milwaukee Polonia by the 1920s had grown into a highly organized community of gradually Americanized, still largely working-class people. From the 1950s and 1960s increasing numbers of Polish Americans, two, three and more generations removed from the immigration experience, were making their move—both into the middle class and out of the city. Today, while there are fewer Polish Americans in metropolitan Milwaukee, their ranks include dedicated individuals committed to sharing their knowledge of the Polish heritage with the public. Their efforts keep alive the history of Polish Milwaukee. At the same time their very existence testifies to the enduring meaning of cultural pluralism in America. ^ Donald E. Pienkos, “The Polish Americans in Milwaukee Politics,” in Ethnic Politics in Urban America, ed. Angela T. Pienkos (Chicago, IL: Polish American Historical Association, 1978), 67. ^ Donald Pienkos, “Politics, Religion, and Change in Polish Milwaukee, 1900-1930,” Wisconsin Magazine of History 61 (Spring 1978), 179-180. ^ Pienkos, “Politics, Religion, and Change in Polish Milwaukee, 1900-1930,” 179; Piotr S. Wandycz, The Lands of Partitioned Poland, 1795-1918 (Seattle, WA: University of Washington Press, 1974), 8-11. ^ Anthony J. Kuzniewski, Faith and Fatherland: The Polish Church War in Wisconsin, 1896-1918 (Notre Dame, IN: University of Notre Dame Press, 1980), 14-17, 82. ^ Susan Gibson Mikos, Poles in Wisconsin (Madison, WI: Wisconsin Historical Society Press, 2012), 58; Kuzniewski, Faith and Fatherland, 19. ^ Pienkos, “The Polish Americans in Milwaukee Politics,” 67-68, appendix 3c. ^ References to the various “waves” of Polish immigration are found in “Milestones in Polish American History and Contributions,” on the Polish American Congress website, last accessed June 9, 2017. ^ John Gurda, The Making of Milwaukee (Milwaukee: Milwaukee County Historical Society, 1999), 133-136. ^ Gurda, The Making of Milwaukee, 135; Edward S. Kerstein, “The Kaszubas of Milwaukee’s Jones Island” in We, the Milwaukee Poles, edited by Thaddeus Borun (Milwaukee: Nowiny Publishing, 1946), 121-122. ^ Tim Cuprisin, “Milwaukee’s Polonia: One of the Nation’s Oldest,” The Milwaukee Journal, December 27, 1993, B3. ^ “Waukesha County, Wisconsin” and “List of U.S. Cities with Large Polish-American Populations,” both in Wikipedia, last accessed June 9, 2017. ^ John Gurda, “Milwaukee’s Historic South Side: Poles Then, Latinos Now,” jsonline.com, August 2, 2013, last accessed June 9, 2017. ^ Thaddeus Borun, “Poles in Milwaukee Industry,” “Sylvester J. Wabiszewski,” “Greetings and Congratulations,” and Thaddeus Borun, “The Role of Milwaukee Poles in Our Larger Industrial Plants,” all in We, the Milwaukee Poles, 63, 64, 112, 242; Gurda, The Making of Milwaukee, 153-156. ^ Szymon Deptula, “Poles at University of Wisconsin,” Edward S. Kerstein, “Poles in the Police Department,” and Stanley Witkowski, “Poles in the Fire Department,” all in We, the Milwaukee Poles, 145-150, 73-74. ^ Historic Properties and Districts, City of Milwaukee website, accessed May 30, 2017. ^ Separate entries on each of these churches, as well as churches in Cudahy, South Milwaukee, and West Allis, can be found in Thaddeus Borun, ed., We, the Milwaukee Poles, (Milwaukee: Nowiny Publishing, 1946), 3-40. ^ “History of Company K,” We, the Milwaukee Poles, 123-128; The Polish American Encyclopedia, ed. James S. Pula (Jefferson, NC: McFarland, 2011), s.v. “Kosciuszko Guard,” 237-238. ^ “From Polish Women’s Alliance to Our Neighbors in the North…” in We, the Milwaukee Poles, 168-204. ^ The Polish American Encyclopedia, ed. James S. Pula (Jefferson, NC: McFarland, 2011), s.v. “Polish Association of America,” 388; Waclaw Kruszka, A History of the Poles in America to 1908 (Washington D.C.: The Catholic University of America Press, 1993), 231. ^ Angela T. Pienkos, A Brief History of Federation Life Insurance of America, 1913-1976 (Milwaukee: Haerlein Graphics Incorporated, 1976), 2, 13, 17-18. ^ Joseph Karas, “Woodrow Wilson Post No. 11, Polish Legion of American Veterans,” in We, the Milwaukee Poles, 211; Joseph Karas, “Polish Army Veterans Association of America Posts No. 3 and No. 94,” in We, the Milwaukee Poles, 205-207. ^ Pienkos, “Politics, Religion, and Change in Polish Milwaukee, 1900-1930,” 185-186, 188-196; John Jakusz-Gostomski, “The Democratic Party and Polish-Americans,” in We, the Milwaukee Poles, 289-190; Pienkos, “The Polish Americans in Milwaukee Politics,” 71. ^ Donald Pienkos, “How Will Polish Americans Vote in the 2012 Presidential Election and How Influential Might They Be?,” November 4, 2012, Polish American Congress website, last accessed June 9, 2017; The Polish American Encyclopedia, ed. James S. Pula (Jefferson, NC: McFarland, 2011), s.v. “Clement Zablocki,” 557-558. ^ Pienkos, “Politics, Religion, and Change in Polish Milwaukee, 1900-1930,” 184; Pienkos, “The Polish Americans in Milwaukee Politics,” 81. ^ Edward S. Kerstein, “Milwaukeeans of Polish Extraction Serving on the Police Department,” in We, the Milwaukee Poles, 289-190; Pienkos, “The Polish Americans in Milwaukee Politics,” 73; The Polish American Encyclopedia, ed. James S. Pula (Jefferson, NC: McFarland, 2011), s.v. “ Thaddeus Wasielewski,” 536, “Clement Zablocki,” 557-558, “Gerald Kleckza,” 228, “Charles Kersten,” 224-225; and Pienkos, “The Polish Americans in Milwaukee Politics,” 76. ^ The Polish American Encyclopedia, ed. James S. Pula (Jefferson, NC: McFarland, 2011), s.v. “Michael Kruszka” and “Wenceslaus,” 249-251; Kuzniewski, Faith and Fatherland, 45-47; J.A. Kapmarski, “The Kuryer Polski,” in We, the Milwaukee Poles, 53-55; The Polish American Encyclopedia, ed. James S. Pula (Jefferson, NC: McFarland, 2011), s.v. “Leo Krzycki,” 251 and “Francis X. Swietlik,” 510-511. ^ “St. Josaphat Parish” and Albin C. Waligorski, “St. Stanislaus Parish,” in We, the Milwaukee Poles, 16-17, 7. ^ Angela T. Pienkos, A Brief History of Polanki, Polish Women’s Cultural Club of Milwaukee, 1953-1973 (Milwaukee: Franklin Press, 1973), 5-6, 12; Carl Glazewski, “History of Pulaski Council,” in We, the Milwaukee Poles, 59-61; “History,” Polish American Congress, Wisconsin Division website, last accessed June 9, 2017. ^ “Milwaukee Polonia: The Roman Kwasniewski Photographs,” University of Wisconsin Milwaukee Libraries website, last accessed June 9, 2017. ^ Press Release, “Milwaukee County to Host Leaders from Bialystok, Poland,” Milwaukee County website, October 9, 2009, last accessed June 9, 2017. Borun, Thaddeus, ed. We, the Milwaukee Poles. Milwaukee: Nowiny Publishing, 1946. Gurda, John. Centennial of Faith: The Basilica of Saint Josaphat, 1888-1988. Milwaukee: Basilica of St. Josaphat, 1989. Kuzniewski, Anthony. Faith and Fatherland: The Polish Church War in Wisconsin, 1896-1918. Notre Dame, IN: University of Notre Dame Press, 1980. Maass, Christel T., comp. Illuminating the Particular: Photographs of Milwaukee’s South Side. Madison, WI: Wisconsin Historical Society Press, 2003. Mikos, Susan Gibson. Poles in Wisconsin. Madison, WI: Wisconsin Historical Society Press, 2012. Pienkos, Angela T. A Brief History of Federation Life Insurance of America, 1913-1976. Milwaukee: Haertein Graphics, 1976. Pienkos, Angela T. A Brief History of Polanki, Polish Women’s Cultural Club of Milwaukee, 1953-1973. Milwaukee: Franklin Press, 1973. Pienkos, Donald. “The Polish Americans in Milwaukee Politics.” In Ethnic Politics in Urban America, edited by Angela T. Pienkos, 66-91. Chicago, IL: Polish American Historical Association, 1978. Kapmarski, J. A. “The Kuryer Polski.” In We, the Milwaukee Poles, edited by Thaddeus Borun, 53-56. Milwaukee: Nowiny Publishing, 1946.